I spent the last week restocking the freezer with dinners since we were running low after my first marathon. Honestly, having those meals in the freezer was a godsend. We’ve been eating like normal humans despite having a newborn, so I’m keeping the tradition going. 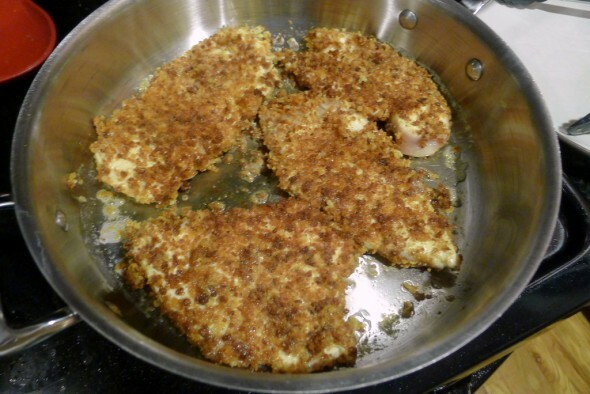 And one of our favorites from the first round was this recipe for Chicken Parm that I cobbled together from a few different recipes. Out of the freezer, you can have dinner ready in the time it takes to make spaghetti. Prepping for the freezer, it’s surprisingly quick. And if you didn’t want to freeze it, it would still be a pretty quick weeknight meal. I prepped 3 of these this time in bulk, so this recipe is for that quantity. You can scale it accordingly. Beat the eggs together in a bowl with 1/2 tsp salt and pepper. 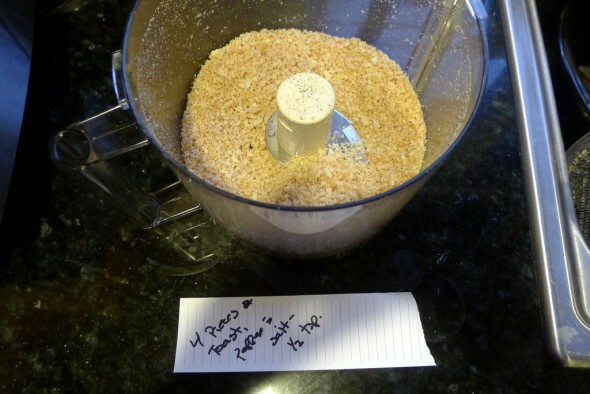 Toast the bread in the toaster and pulse in a food processor with 1/2 tsp salt and pepper. 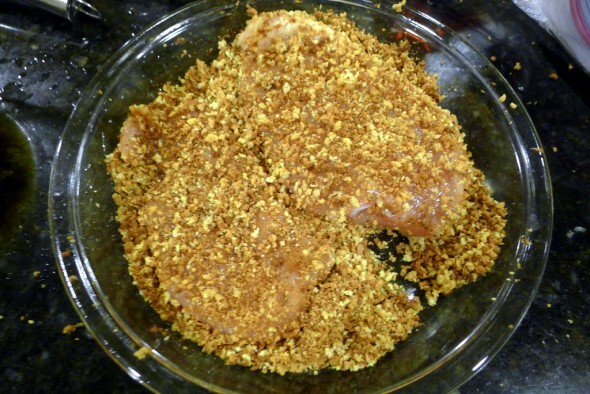 If you want the breadcrumbs to be drier, bake in the oven at 350 for 5-10 minutes. Cut the chicken breasts in half lengthwise to make thin cutlets (if you didn’t just use cutlets). Dredge the cutlets a few at a time in the egg mixture, then coat with the breadcrumbs. Heat a skillet on medium-high heat with 1 Tbsp of oil. Saute the coated chicken breasts in 3 batches until browned and no longer visibly raw (like that one on the top right below), 2-3 minutes per side. Place chicken on a platter to cool. If you plan on freezing these, continue here. If you want to finish this for dinner tonight, skip ahead. 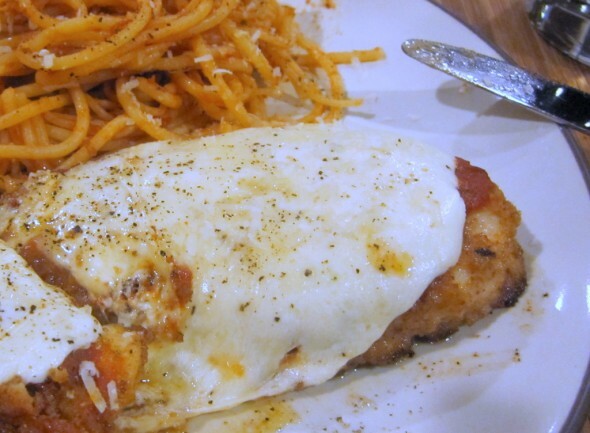 While the chicken cools, slice the ball of mozzarella into 12 slices. Put 4 slices of mozzarella and a handful of provolone into a small Ziploc baggie. When the chicken is cool, put 4 of the cutlets into a large Ziploc baggie and place the small bag of cheese inside of it. This keeps the cheese and chicken separate so they won’t freeze together. Repeat the process with 2 more bags and the rest of the chicken. Freeze the dinners. When you’re ready to eat, take a bag out of the freezer and thaw. Preheat the oven to 400 degrees. Place the 4 chicken breasts on a greased cookie sheet. 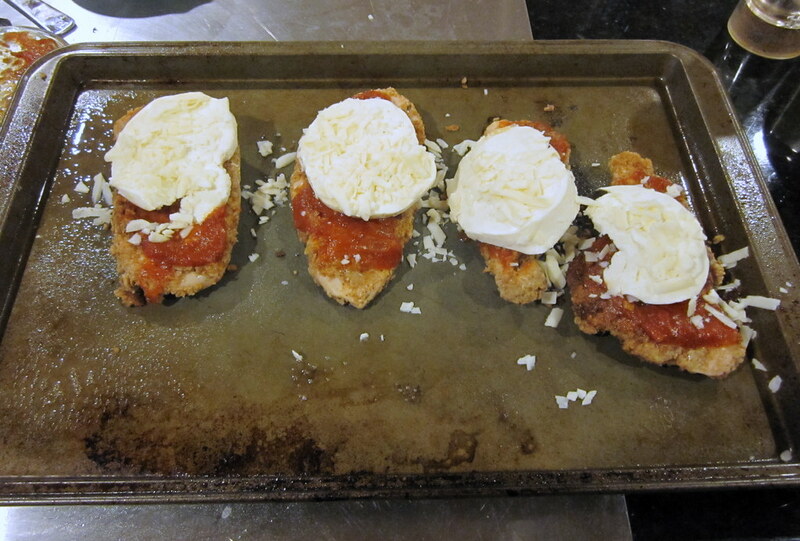 Cover each with a spoonful of marinara sauce, then a slice of mozzarella and a sprinkling of the provolone. Bake in the oven for 5-7 minutes, until the cheese is completely melted and bubbly. Serve with spaghetti, or serve it on hoagie rolls as a chicken parm sandwich.